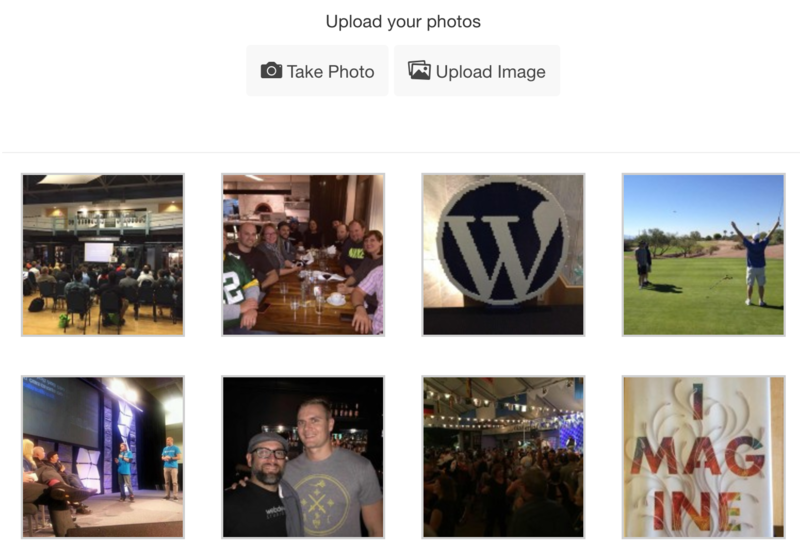 The AppCamera extension allows your app users to take photos that will be uploaded directly to your WordPress site. You can then display those photos in your app. AppCamera also has integrations with WooCommerce, BuddyPress, and a shortcode you can use on any post or page. Install and activate the AppCamera plugin that you purchased from your AppPresser account. You will now find a new "AppPresser Camera" tab in your AppPresser settings. Please visit there to configure the Camera extension settings. The AppCamera extension offers multiple settings to help you configure its behavior. Below we will discuss each in greater detail. Add the license key you received, with your purchase, here. This will enable you to receive updates for the plugin as we release them. Uploaded photos must be moderated? Use this setting if you want to be able to review/approve/deny all uploaded photos before they get published live. Use this setting if you want to be notified by email, using the WordPress-set admin email address, whenever a user uploads a new photo, regardless of moderation being required. When you enable this, and have uploads set to create new posts, the uploaded image will also be set as the post's featured image. Text that will be displayed as a description on the rendered upload form. Text that will be displayed to logged out users. Once you are happy with the settings, click the "Save Settings" button. AppCamera automatically adds a photo upload button to WooCommerce product photo galleries and the BuddyPress activity modal (with the AppBuddy and AppWoo plugins also installed). You can also manually add the shortcode (described below) to a page or post, which shows a photo upload button in your app. The Take Photo and Upload Image buttons only appear when a user is logged in, otherwise they will see "Please login" text. It is not secure to let logged out users upload images to your site, so this is not an option in our plugin. The AppCamera plugin does not handle displaying your images for you, but there are a variety of ways to do this. If you are using [app-camera action="new"], each photo will create a new post. You can then display these posts any way you like, such as a custom template in your theme, a plugin like Display Posts Shortcode, etc. You can use the post_type attribute to specify a post type that you have already registered, such as "app_photos" to only display these photos and not other posts. This method supports moderation. post_type string Allows you to specify a post type to post the photo to. Note: this parameter can only be use when action is "new" any post types that are registered. Note: use the post type slug. not_logged_in string What text to display for not logged in users. Default: "Not logged in" saved setting or "Upload your own customer image"
description string What text to display for the description. Default: "Description" saved setting or "Upload your photos!" force_login boolean Set to "false" to allow logged out visitors to upload photos. Default: "true"
You can choose to moderate images before they are displayed on your site. To moderate photos, go to the AppPresser settings page, Camera tab, and check "Uploaded photos must be moderated?" and save. If you have checked that uploads need to be moderated before being added, the section for this will not appear until there are actually any to moderate. Once moderation-pending photos are available, you will see a new "Moderate Photos" submenu item in the "AppPresser" menu. Next to it will be a notification of how many are pending to be approved. You will also be able to access this page from a "Photo Moderation Panel" link that will show up next to the "Save Settings" button in the AppCamera tab. When viewing the moderation page, you will be presented with a list of pending photos that you can view, approve and deny. A thumbnail preview, file name/type, uploader, post it was uploaded to, and date will all also be available information. Checkboxes along the left allow you to approve or deny in bulk, and each has their own approve or deny links. Once the queue is empty, the menu item and link will disappear until there are more to take care of. Hooks right after the photo upload handling is done. Passes in the affected post ID and the new attachment ID from the upload. This allows you to do more processing on either post or attachment afterwards. Allows you to intercept get_option( 'active_plugins' ) before our extension determines if the required plugins are presently active. Allows you to intercept and modify, if needed, the text to display as the description. This value is originally set in the Camera section of the AppPresser Settings page. Allows you to intercept and modify, if needed, the text to display to not logged in users. This value is originally set in the Camera section of the AppPresser Settings page. Allows you to intercept and modify the label for the post_title field that is displayed via the [app-camera] shortcode. Allows you to intercept and modify the default message that gets set with the email notifications for new uploads. An image tag with the newly uploaded image. Approve/Deny links if moderation is enabled. Allows you to intercept and modify the default subject that gets set with the email notifications for new uploads. Allows you to intercept and modify the default email recipient who will get the email notifications for new uploads. Allows you to intercept and modify the default size for photo blog image embeds. Allows you to intercept and modify, if needed, the array of arguments used for the publishing of the post once a photo is approved from moderation. $updatepost //array of post arguments for the post.